Finally we got to Machu Picchu and it exceeded even my high expectations—more beautiful, more awe-inspiring than I expected and certainly the most beautiful place I’ve ever seen. By luck (rather than design) we were visiting at the very best time of the year; mid April is the end of the rainy season (or the very beginning of the dry season.) At this time of the year, there’s a good chance of sunshine, and Machu Picchu is covered with lush, gloriously green vegetation. If we had gone in March, as originally scheduled, we would have had the lushness but it would have been gray and drizzling. If we had gone in the summer, we would have been virtually guaranteed sunshine but the landscape would be brown. On our first day we had brilliant sunshine. Rick was still having problems with altitude and vertigo so he wasn’t able to do the 3-hour tour of Machu Picchu. He insisted I go without him. He wandered around on the lower level and took in the spectacular site and glorious weather. I managed the tour but was in excruciating pain the whole time. Because I’m not used to doing so much walking, and also because of the lingering effects of a really bad accident decades ago, I developed seriously painful corns and calluses on my left foot. I was determined not to let this get in the way of seeing Machu Picchu. There seems to be something about major archaeological sites which (for me) brings on an attack of corns. Years ago Rick and I were at Pompeii and I had equally horrendous corms on my left foot—-the foot that was smashed when I was hit by a motorcyclist in 1984. I was enthralled by Pompeii and determined to see everything despite the fact that my left foot felt like it was on fire. Somehow I managed to do it. Both Machu Picchu and Pompeii were worth the suffering! The next day was rainy and foggy and we passed up the hike in the rain and hung out at Machu Picchu Sanctuary Lodge while most of the other people in the group went hiking. Rick was still having an altitude reaction and I really needed to give my flaming foot a rest. I enjoyed seeing Machu Picchu enshrouded in mist—-a very different kind of beauty than that of the previous day. The rest of the day was spent on the trek back to Cusco. I observed a fascinating change in the behavior of my fellow tourists. On the way to Machu Picchu, the tourists were stunned by the beauty of the region. Those unfortunate enough to have seats on the wrong side of the train were standing in the aisles straining to get a glimpse of the astonishingly vertical mountains--unlike anything else I’d ever seen. They reminded me of the mountain scenes I’ve seen on Chinese scrolls. On the way back—-just one day later--the tourists’ responses were very different. No one was looking out the window. They were chatting, reading, writing postcards, napping. How quickly we adjust; the magnificent scenery had become a backdrop. To appreciate the architectural and engineering genius of the Incas you need to see more than the marvels of Machu Picchu. What astonished us was how the system of roads, fortresses, and agricultural terraces covered such an extensive area. 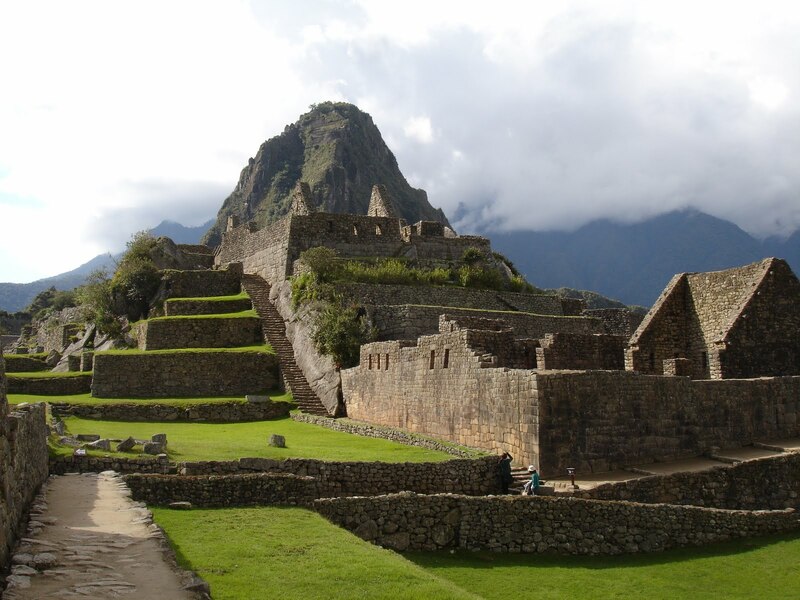 The Incas terraced an entire region—-managing to turn inhospitable mountain terrain into rich agricultural land. The bottom line on tours to Machu Picchu: although it would have been difficult to make the arrangements on our own, we could have done it. And there are all kinds of 2-3 day trips which can be booked in Cusco. 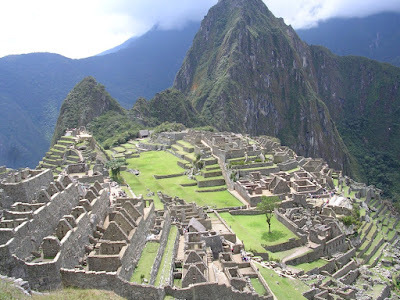 It’s not necessary to book a whole Peru trip just to get help with arrangements to Machu Picchu. In retrospect, it’s what I wish we had done. And if you are getting a hotel package, do some research on the hotel and get a guarantee that the hotel advertised is the hotel the group will actually use. Hotels are a challenge at Aguas Calientes, the hideously ugly town where tourists stay unless they can afford the $800.00 a night accommodation at Machu Picchu Sanctuary Lodge. Our tour company changed the hotel they had originally said they were going to book. I suspect the reason was that hotels are now charging more to make up some of what they lost when Machu Picchu was closed. Rather than eat into their profit margin, the tour company decided to downscale significantly, and put us into the hotel from hell. Given that the company advertises that its hotels are all 4 star, this was an inexcusable bait and switch. The tiny rooms were big enough for 2 small beds and nothing else. Rick and I were among the lucky ones—-our third floor walk-up had a window. Several members of our group had rooms without windows, no hot water, shower doors that did not open, shower doors which fell off. There was no excuse for a hotel like this. So by all means go to Machu Picchu; but if possible don’t wait until you’re 65, and do careful research if you’re thinking about group tours. God, that sounds beautiful! I am so afraid that circumstances will mitigate against my making it to the places I'd like to see. When I finally had the free time to travel and had just retired with the necessary means, the recession hit. We had to make a choice between helping our kids cope or making those long-awaited trips. Still, I love to enjoy those trips vicariously; I may be the world's most appreciative audience for others' slide shows and travel tales. Thank you for the detail. I agree with Nance, I love to hear about your trips and experience them vicariously. You are quite the trooper, Karen! I'm starting to lose my taste for travel. I still want to get out and see the world but not as often as I once thought I would. I'm finding out how much I enjoy being home and puttering in my garden! It sounds like your trip would have been nearly perfect if it could have had an editor. If there aren't any other difficult-to-navigate spots on your dream list, you can turn your back on tours, maybe get more comfortable shoes, and travel in off times for the garden. I'm betting you'll get back your taste for travel!